Jeremy Corbyn has pledged to issue a pardon to suffragettes and issue an apology to the women who fought for voting rights. This morning the shadow cabinet held a special meeting at the Museum of London to celebrate the granting of suffrage to some women aged over 30 and launch Labour’s year-long campaign for women’s equality. Addressing MPs, Corbyn revealed that “Labour in government will both pardon the suffragettes and give an official apology for the miscarriages of justice and wider persecution they suffered”. 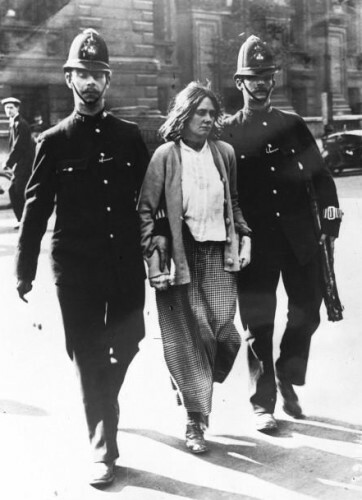 More than 1,000 suffragettes were arrested and many of the women were imprisoned. “As a country, we must recognise and honour the enormous contribution and sacrifice made by women who campaigned for the right to vote,” Corbyn added. This morning on Radio 4’s Today programme, home secretary Amber Rudd was asked whether the Conservatives would be prepared to overturn the protestors’ convictions. Rudd said she would “take a look at it” but described the process as “complicated” and “not straightforward”. Theresa May has chosen to honour the centenary by drawing attention to the abuse faced by MPs, warning of a “toxic politics of intimidation”. Last week, Tory MP and potential challenger to the prime minister Jacob Rees-Mogg encountered demonstrators when speaking at a university. The prime minister is set to reveal government plans to crack down on intimidation of parliamentary candidates and campaigners. Such proposals have been criticised by figures including Diane Abbott, who was recently found to receive over 50 per cent of abuse directed at MPs. Abbott commented on Twitter that there is a need to prosecute all serious threats and it is “unclear why MPs should have special rights”.